If you can’t guarantee a correct outcome anyway then is the hassle really all worth it? Is killing the momentum in a game, forcing your players to hang around sipping Lucozade for three minutes while the powers that be somewhere near Heathrow decide whether Bobby Firmino has actually got to gear up for a spot-kick actually worth it? At the moment, in its current format, I don’t think so. Add to this that the system completely takes away the joy of scoring a goal, it’s hard to get behind it, I was very much on the fence regarding VAR but after watching it create absolute farce in a Liverpool match I’ve moved further into the “no” camp for the time being. Some argue that we should go and speak to the rugby boys, and I agree, the sooner the better but rugby is a stop-start game, football is not. I honestly feel that the only way I will come around to the idea is if it operated on a sort of hawkeye basis, three challenges per manager perhaps? This brings its own challenges too and however it’s incorporated there will always be issues but a fan of the system or not, you have to agree that last night was just preposterous. 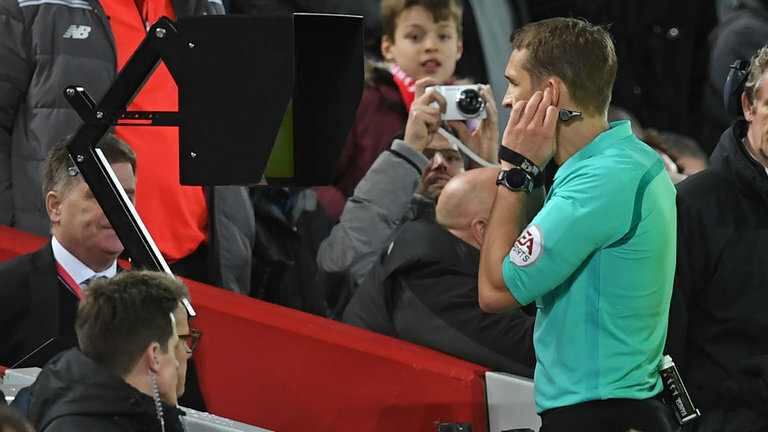 Away from the VAR, Liverpool didn’t exactly give a lot back to the utterly confused fans at Anfield. Firmino obviously missed the VAR awarded peno but his other goal was a lovely chip. Salah found himself on the scoresheet yet again but other than that there was nothing to write home about. A defence arguably weakened by the re-introduction of Alberto Moreno, struggled immensely to deal with the West Brom attack. It wasn’t just Moreno having issues though, Matip, van Dijk and Mignolet all had their problems and quite frankly it just isn’t good enough. I understand that Klopp is a manager who prefers to stun with the attack, that’s fine but if you can’t get your defence to deal with the basics, you haven’t got a cat in hell’s chance of picking up any silverware. Virgil hasn’t been here long but for the price tag on his head (whether that’s his fault or not) he simply must begin to consistently command his defence and make those clearances. I can highlight at least three occasions last night where he was poorly positioned or delayed in action. On top of this, the defence doesn’t always begin at the back four, Liverpool were pounded in the middle of the park last night and Danny Murphy on Match of the Day correctly highlighted that some of the lads just weren’t putting the work in and tracking back on Saturday night. Then, of course, we have the bench issue, the three substitutions last night were Danny Ings, James Milner and Jordan Henderson, all three of whom can certainly “do a job” but is that really a strong enough bench for a team like Liverpool? I don’t think so. The Reds have money in the bank from the massive sale of Coutinho but it doesn’t look as though any of it will be spent in January. Liverpool may be doing well in the league but the only glory from that run is securing a place in the Champions League, nobody is going to remember us finishing second if we follow up in the 2018/2019 season with no improvements to the side and no challenge for the title. With Huddersfield next in the league Klopp needs to find a win to avoid what could be a very slippery slope in the second half of the season. Read More: Baggies Knock Reds Out The Cup | VAR Yes/No?